AP Inter 1st Year Time Table 2019: AP Intermediate First Year Public Examination Time Table March 2019 are released at at bieap.gov.in. Students may check and Download their Manabadi AP Inter First Yr/Junior Inter Exam Schedule Subject wise From official PDF. Andhra Pradesh Intermediate has taken a decision About Intermediate 1st year and 2nd year Examinations March 2019. They have discussed and Finally Released the Dates of AP Intermediate 1st year Exams 2019. Check the AP Junior intermediate 1st year exam time tables from links given below. Andhra Pradesh (AP) Government conducting the AP inter 1st exam 2019 Separately apart from Telangana(TS) Inter 1st year 2019 Exams. Because after the Bifurcation of Telangana and Andhra Pradesh, the two governments had decided to conducts Exams Separately with separate Question Papers. Last Year, AP and TS Governments Conducted the AP inter 1st year & 2nd year exams separately and released the results. AP Junior Intermediate/Inter 1st year 2019 Exams are conducting From 27th February to 16th March as per Primary Schedule by Intermediate Board. These Schedule sent to All Colleges in Andhra Pradesh and if all set, then then official AP inter 1st year exam time table 2019 will be Release in 15 days at bieap.gov.in website. Already AP Inter 1st year 2019 exam fee notification released. please pay the inter 2019 fee and get the registration number to Download AP Inter 1st year 2019 hall ticket. 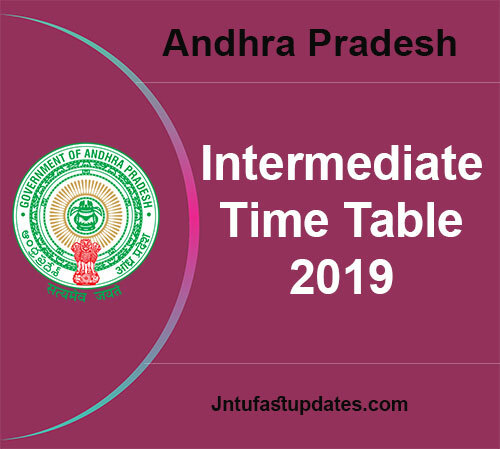 Note: Andhra Pradesh State Board of Intermediate 1st Year March 2019 Exam Time Table announced. Last year, Intermediate Public Examinations are held from February 28 to March 19, 2018. Education Minister Ganta Srinivasa Rao and Intermediate Board Commissioner B Udaya Lakshmi released the examination schedule at a programme held in Vijayawada city. As marry as 10,48,688 students has written the examinations at 1,600 examination centres Out of which 4,96,660 students are written the first year examinations, while 4,82,235 students appeared for the second year examinations. The examinations are held from 9 am to 12 noon. Also 35,382 students has written Intermediate first year vocational examinations and 34,311 are written second year vocational examinations. The practical examinations are conducted in the jumbling system. While, first year candidates will get grades and second year candidates will be given marks. The Ethics and Human Values Examination will be held on 28th January 2019 from 10.00 A.M to 1.00 P.M (one day). The Environmental Education Examination will be held on 30th January 2019 from 10.00 A.M to 1.00 P.M (one day). The Practical Examinations will be held on 1st February – 20th February, 2019 (including Sundays) in Jumbling System. Click on AP Inter 1st year/ Junior Inter exam Time table 2019 option. Click on it and Enter Your Registration if needed. Other wise click on it save the pdf of ap inter 1st year exam time table march 2019. Take Print out and Save it for further Preparation. Stay Tuned For AP Intermediate 1st year 2019 Previous Question papers with answers of science, maths, chemistry, biology, commerce and others. And also stay tuned for AP inter 1st year 2019 Hall ticket/ Admit card Download Option, AP Inter 1st year 2019 Results release date and All. Time tables are also available at Manabadi, Schools9, indiaresults websites. How to help her to clear the exams immediately? how to download 2nd year halltickets 2018….